RV owners often use self-storage facilities because of limited space on their own properties, or because of regulations against large-vehicle storage imposed by cities and homeowners associations. If you decide to store your RV at a self-storage facility, your top priority should be good security, said David Blunt, a member of the Circle City Campers RV club in Corona, CA. Thieves sometimes target RVs because they often contain expensive electronic equipment, he said. It would be safer to remove all valuables before storage, but many RV owners find loading and unloading vehicles to be inconvenient, Blunt said. That’s why good security is essential. When you visit facilities, look for security cameras, fencing, and gates that require the use of personal security codes. Blunt says personnel should be on duty around the clock to keep an eye on parked vehicles. The safest place to store an RV is in a locked, enclosed unit, but not all self-storage facilities have units that are large enough. Any RV that is parked outdoors should be covered to protect it from the elements. For added protection, try to find a facility with carport-style parking when indoor parking is not available. No matter what type of space you rent, be sure to take measurements to make sure it’s large enough to hold your vehicle and allow you to enter and exit comfortably. 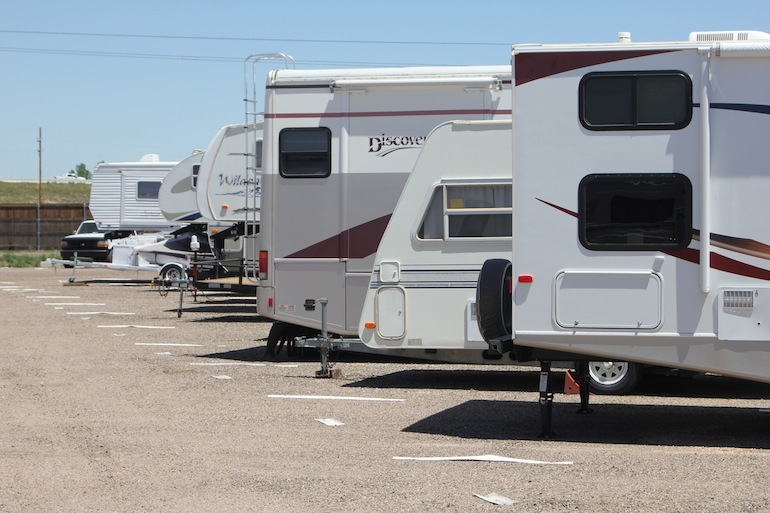 Once you’ve chosen a facility, you’ll need to prepare your RV for storage. Whitaker said it’s important to drain all water from your storage tanks and water lines. If you’re worried about pipes freezing during winter months, he suggests adding a nontoxic RV antifreeze to the kitchen and bathroom plumbing. Be sure to fill up your fuel before storage to prevent condensation. You can add a stabilizer to prevent your fuel from breaking down. If you plan to park for more than a few months, it’s best to drain the tank and refill it when you’re ready to return to the road. Thoroughly clean your RV before storing it and make sure any fabric awnings are dry. Don’t forget to close your window blinds to avoid sun exposure to upholstery, carpets and draperies. When parking outdoors, if you place wood or plastic beneath your tires to make sure they’re not touching the ground, it’ll help prevent the rubber from aging and cracking during storage, Whitaker said. Inside your RV, remove all perishable foods. People who are new to RVs often forget to prop open refrigerator doors to prevent mold from growing, Blunt said. “That is the number one mistake that newbies make,” he said. Bob Winet, a former storage facility owner who provides consulting and investor services for storage industry clients, said it’s difficult to cite a typical cost for RV storage in the U.S. That’s because rental fees are “all over the map,” he said. Local competition and availability can influence prices. Generally, you’ll pay the most to store an RV near urban centers, where less storage space is available. Some facilities have made RV storage their specialty, offering such amenities as “dumping stations” that let tenants drain wastewater from their storage tanks, Winet said. Also, some enclosed climate-controlled units that come with sinks to help with cleanup. Whitaker said he considered storing his RV in a fully enclosed space for $300 a month, but frugality led him to choose a covered outdoor space for $70 a month. Monica Rivera, manager of the El Monte Store It Now storage facility in El Monte, CA, said facilities typically have strict requirements for the RVs they accept. First and foremost, the RV’s engine must be in working order. Be prepared to demonstrate that your RV is properly registered, licensed and insured. The goal of such rules is to prevent facilities from becoming dumping grounds for old vehicles.